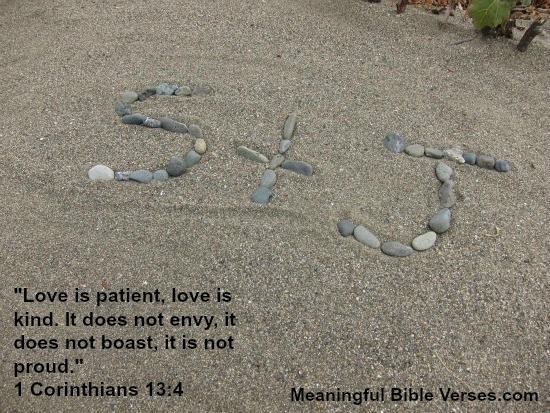 Bible verses about love are common in the Bible. I think that because it is such an important topic and it is one of the things that define God it is written about a lot. There are passages about romance, family, animals and friends that all relate to love. We will start by looking at some of the “famous” love verses then we will look at some of my favorites. We will start with the “love chapter”. This is probably the most famous and the best description of this term ever! These are probably the most famous love bible verses. You can see why...what a great definition. This really shows what God meant when he used this word in the Bible. It’s too bad that we humans have messed up what God meant to be so amazing. Galations 5:13 For you were called to freedom, brothers. Only do not use your freedom as an opportunity for the flesh, but through love serve one another. Ephesians 5:25Husbands, love your wives, just as Christ loved the church and gave himself up for her. Proverbs 13:24Whoever spares the rod hates their children, but the one who loves their children is careful to discipline them. There is so much in the bible about this topic that it is really hard to take it all in. Once you start to study Bible verses about love though you see that all of the verses go hand in hand. Everything works together. The more you read these verses the more you understand them because they all work to explain each other. It is so hard to see so much of our world doing the opposite of what most of these Bible verses about love say to do. It is so sad to think about what our lives would be like if we would all just read what the Bible has to say about love and just apply it to our lives. The easy thing for us to do is focus on ourselves and forget about what those around us need, but the hard thing to do (but the right thing) is to follow Gods advice to us. As usual the right choice is also the hard choice.